We last heard from vocalist Carol Fredette on her first Soundbrush recording, Everything in Time (2009). 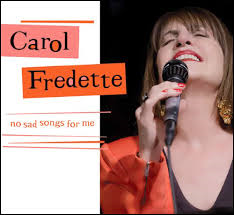 Her repertoire was replete with, …”Light latin jazz, humid islands, and secure mainstream treatments.” Fredette remains fairly true to this mix of styles on No Sad Songs For Me, specifically addressing all songs of upbeat content, if not tempo. The singer calls upon much the same band as on the previous recording, specifically pianists Helio Alves. It is notable that No Sad Songs For Me is executive produced by Pablo Aslan and Roger Davidson, two names closely associated with Latin jazz and bossa nova, styles that potently inform Fredette’s repertoire here. Fredette is serious about the title and title tune for this recording. It is surprising she included Jobim’s “Double Rainbow” and not his “No More Blues.” These songs are upbeat and the universal mood of this recording is supercharged positive. Fredette commands Bob Merrill’s “It’s Good to be Alive” and Irving Berlin’s “The Best Thing for You.” The former she treats as a delicate ballad and the later Latin-infused and simmered on high heat, Kevin Winard’s percussion being particularly effective. The Cahn-Van Heusen chestnut “To Love and Be Loved” is gently rendered as a perfect cocktail hour ballad. 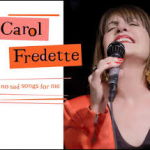 Fredette’s support is solid and competent, providing the singer an environment for her pristine vocal delivery of this most attractive recital.